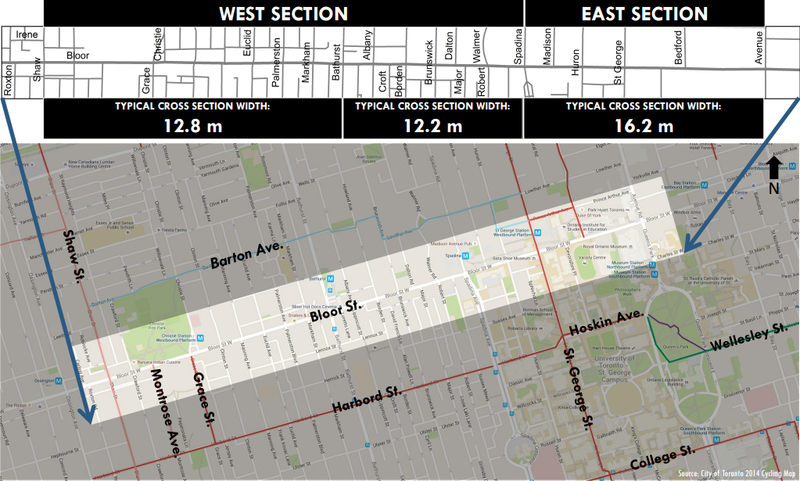 Last night the City presented the preferred option for the Bloor Street bike lanes (pilot) (see more coverage here, here). I couldn't make it but looks like it was option C, which was the one with the most extensive physical separation between people biking and driving. That's nice and quite a surprise actually. I had expected more compromises and we got fewer. It is indeed something to be celebrated given the large political barriers overcome (and still to be overcome). Councillors Cressy and Layton should be commended for pushing this and taking a political risk. A key part of this is the new cycling manager Jacquelyn Hayward Gulati who is willing work hard at taking advantage of this political opportunity. Previously the Cycling Unit has often been content at not upsetting the apple cart and were more than happy to delay the Bloor bike lanes by agreeing to unnecessary Environmental Assessments. That being said, this will still be a game changer as much as the protected bike lanes on Richmond and Adelaide were game changers, having a huge impact on people flowing into, through and out of the core. It's only been 40 years! That's pretty good news. I'm liking the pilot projects for the most part. And they've been tending to lead to more permanent and more connected infrastructure, which should be the real goal. This is really great and somewhat of a surprise considering the opposition to it in the past. Doing a test of it will help everyone get a sense of how it would work. And keep pushing for protected intersections. There might be resistance now but as we can see, things can change overnight with the political winds and one day it'll be not too far out for them. I brought up protected intersections twice with the project team at both meetings. Dutch-style protected intersections seem to be completely out of the question (primarily because there is not enough space on the 20m ROWs on streets such as Bloor). Cycling staff is looking at a pilot option at Bay & QQ. Those type of intersections work in the Netherlands - and make streets safer for everyone - because they separate two groups - pedestrians and cyclists that compete for a right turning motorist's attention. In another words a Dutch driver would turn her vehicle at an almost 90% angle, see the cyclists coming from the right, advance, yield to pedestrians and move on. If a buffer zone is built on a street such as Bloor the drivers can only turn partially thus putting the cyclists into their blind spot. However different options is possible on most downtown streets which is just as effective. - Separate signals for cyclists at main intersections. For instance, a bike green starts a few seconds before the car green. Therefore the cyclists take off before cars start and take their positions. A right turning driver will see both groups together and complete their turn only after they clear the intersection. - In places where pedestrian volumes are immense and the street is narrow (i.e. Bathurst & Bloor) right turns for cars can be banned at all times. Drivers will easily find alternative routes and through traffic flow will improve. The one-way side streets pattern is already laid strategically in the Annex making cutting through neighbourhoods impractical to evade these restrictions. Both these solutions require political will to find the money and reduce the traffic capacity of the street and are obviously out of scope of the pilot project.